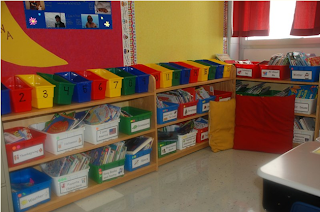 I have TONS of books in my classroom! That's a great thing, but they need to be organized in order for children to find what they need. I divided my books into two groups-- picture books and independent reading books. My picture books currently span three bookshelves. My sweet Dad made my bookshelves when I first found out I had a teaching job. They even have wheels on the bottom :) I bought my tubs from Dollar General the summer before I started teaching. They are slowly starting to crack and need to be replaced. I like to sort these books by theme because it's easier for me to find the book I'm looking for (I don't always know a specific title or author). Each tub has a different dot label code. I used the circle labels and rectangle labels for more combinations. Many of these books also have a reading level sticker at the top (to help my kiddos make better book choices). The Scholastic Book Wizzard is an a-ma-zing resource for levelizing books. My kids' book bins are stored across the top of the shelf. 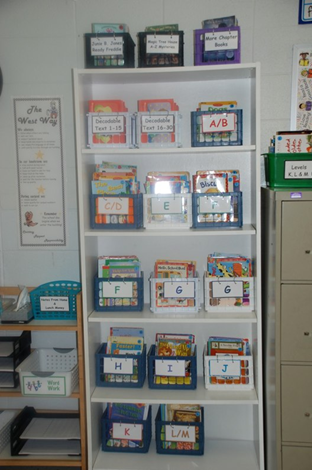 Here's a picture of my picture book library. Sorry it's not the greatest picture. It was taken at the beginning of last school year, with no intent of using it for a blog. Click here to download my picture book labels. The last page was left blank so you can add your own themes. I used CK Handprint if you want your font to match. 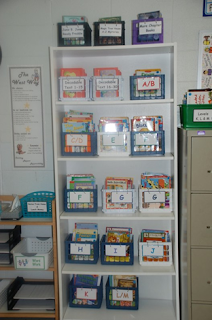 Another spot in the room is only for leveled books. These are the books my kids pick from to fill up their book bins each week. As they get better at book selection, they are allowed to also pick picture books to add to their independent reading boxes. I love storing these books in the little crates, found at Dollar General. They fit just perfectly in there. I also have the reading sets from our reading series, StoryTown. I think we originally were given 6 copies of each book. I never use all 6 books at once, so I took one book from each set and added it to the books on the shelf above. The other 5 are stored together where children don't have access. Your blog is full of great ideas. Thank you for sharing them in such a creative manner. This blog post is so much informative. It’s really helpful for who want to do this. I think it’s easy way to do this. Doing this is not so easy, but if you follow the instruction then you does this so easily. You can find out more easy and smooth way to visit this site.